When you walk into Sus Hi Eatstation, you instantly become a Ninja. You will be greeted as a Ninja, as soon as you walk in by other Ninjas with fun nicknames. While in line, you'll hear things like the resounding boom of a gong when appetizers are ready, Ninjas yelling "FIRE!" when they melt cheese and interesting greetings to welcome you into the Ninja family. Just on entry points alone, this place is already pretty cool. Everything at this establishment is meant to be fun and they love wordplay. In their own words, everything they do is because “That's how a true Ninja rolls.” Of course they are talking about sushi rolls, but the idea and concept is really fun. At Sus Hi Eatstation, they encourage customers to be creative and to use their imagination to create sushi that is uniquely their own. Every single item that they make is unique to the individual, and they never get two items that are identical. Every Ninja has their own style and they are here to help you master it. The process starts when you order. You choose a roll, made with dried seaweed, a bowl, or a flour tortilla as your base. Next you choose white rice, brown rice or salad, and then you pick a protein. They have plenty of offerings from spicy tuna, salmon, tempura shrimp, cooked shrimp, chicken and even grilled steak. Tofu is also a popular option. Now it's time for your ingredients. They have 20 options to choose from.. cucumber, cream cheese, carrots, scallions, masago, tempura flakes and yes, they even have BACON, basically whatever you can conceive to make some super dank sushi roll or bowl...they have you covered. Finally you move on to the sauce selection. With 10 choices from Triple X hot sauce to Ginger Sesame, Sus Hi has got a sauce for you. Hot, sweet, tangy, hot and sweet, traditional ponzu, you can add the perfect amount of zing or heat or sweet to anything the Ninjas make you. They also offer small bites like Krab Rangoon, Egg Rolls, Dumplings, Seaweed Salad, and something they call Rice Fries made with rice and nori tempura served plain or loaded with cheese, bacon and scallion. For something a bit healthier, you can make a roll with Brown Rice. This is a custom roll made with brown rice, tempura shrimp, tuna, avocado, cucumber, cream cheese, carrots, tempura fried & topped volcano style which is krab, scallops & spicy mayo with masago. It was so good, and it was custom made. So many different options to create your own roll, bowl, or wrap. This was a roll made with white rice, spicy tuna, salmon, cream cheese, avocado, scallions, cucumber & masago & a side of spicy mayo. Building your own bowl is a good way to get as much of what you want all in one place. This bowl is literally loaded down with brown rice, salmon, spicy salmon, cucumber, volcano toppings, edamame, scallions, carrots, fried sweet potatoes, daikon, avocado, seaweed salad, masago, nori seasoning, ponzu sauce & the house signature 'Triple X' sauce… like BOOM! Fried pork & vegetable dumpling was nice and crisp on the outside & even better dipped in the house signature 'Triple X' sauce. Integrity and Fast sushi with high quality ingredients is what Sus Hi Eatstation is all about. They stand by the quality of ingredients that are prepared fresh daily. Look into the kitchen dojo and you'll find Ninjas skillfully preparing your food for the day. 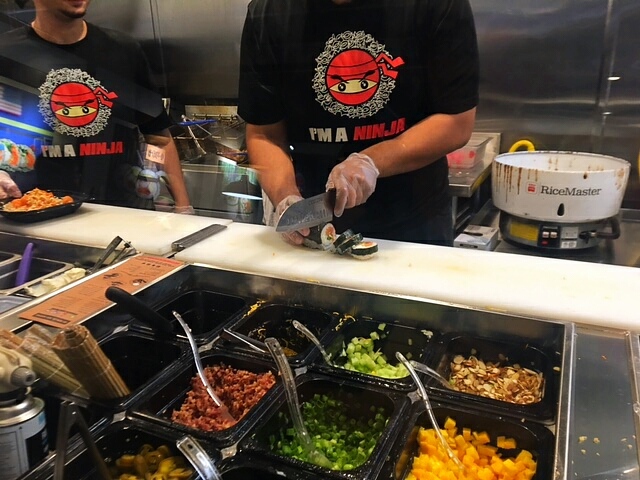 They believe in FRESH, FAST & FUN Sushi, serving food that they are proud to present to all those within the Ninja family! Built by you, and served by ninjas, this is fun fast sushi in a cool atmosphere and the only limit to what type of sushi experience you want to have is your own imagination. This review took place at the Altamonte Springs location, but they also have another location at 4498 N Alafaya Trail #324, Orlando, FL. Both locations open at 11:00 am. The Orlando location has a standard 10:00pm closing time, while the Altamonte Springs location closes at 9:00pm, except for Friday and Saturday, they are open until 10:00pm.